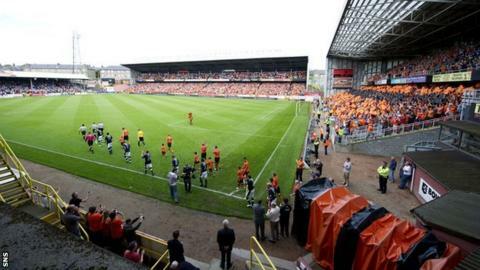 Dundee United's financial results for the year to June show the club posted a profit of £1.45m, with bank debt and directors' loans having been reduced. Revenue suffered a 3% fall to £5m and the percentage of wages to turnover ratio increased from 74% to 76%. But the sales of David Goodwillie and Scott Allan boosted the club's income with a profit of over £2m in transfers. And United chairman Stephen Thompson feels the Scottish Premier League is "thriving" despite Rangers' absence. This season's top flight is the first not to feature the Ibrox side, who were relaunched and placed in Division Three following financial problems. "It has not had a huge effect on us I must be honest," he told BBC Scotland. "It's certainly not had the Armageddon scenario that was predicted. In fact we had a game here on Saturday versus Aberdeen, I thought it was a great atmosphere, open football, a great game and a great advert for Scottish football. "Things move on in the world. The SPL is very interesting this year. "We all expect Celtic to win the title, but after that there is not a lot between any of the teams. You win a couple of games you jump four, five or six places in the league. Everyone's beating each other." However, speaking on United's website, Thompson cautioned "that the current and forecast economic situation continues to present challenges and whilst the board remains committed to ensuring a team capable of producing performances on the park and entertaining the supporters, we must also ensure that a prudent fiscal policy is maintained". "Our supporters have responded to the recent challenges in magnificent fashion, culminating in a significant increase in season ticket sales," he added. United's bank debt was down from £5.4m to £3.93m and United say that a further £225,000 reduction was made in July. And the club said: "Since the end of the financial year, the club has made progress in significantly reducing its overall wage costs and this will be reflected in the next financial statements."